One of the major kitchen trends right now is redoing the kitchen for that traditional look that has been more or less phased out by modernity. Appliances, backsplashes and storage spaces are all part of the look, but one of the major components of that traditional kitchen feel is the colour scheme. It can be hard to get just the right colours for that traditional feel, but there are certain colours that are more prevalent in home and living magazines. 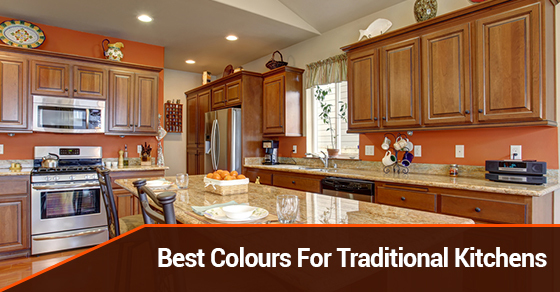 Below are the five best colours for traditional kitchens. Creams harken back to the 1960’s, when soft cream colours ruled the day. Cream colours are great because they break up lines and add a smoothness to the look of a kitchen. You just don’t find it in more modern kitchens that use shades and colours to add lines, breaking the kitchen up much more than traditional colour schemes. Nothing is as classic or iconic as the white kitchen. Simple, elegant and able to really bring out the look of tile backsplashes and dark wood furniture and countertops, white is great for highlighting and bringing to life the other traditional themes that you have used. Muted colours are designed to blend into the background of your kitchen and make everything else look more pronounced. While the colour scheme is important, it is not the only element of making a traditional kitchen; the wood and other materials that you use to create the look need a colour scheme that isn’t overbearing. Within the colour scheme itself, the traditional kitchen relies on and utilizes patterns in order to create a playful, traditional feel. The rustic charm of fruits, flowers and butterflies are reminiscent of older kitchen designs that were less focused on sleek, broken up space, and more on creating a welcoming atmosphere and mood. In addition to the creams, whites, mauves, greys and greens that make up the majority of traditional kitchen colour schemes, a large part of recreating that traditional look is opting for colours in the above categories that compliment the surrounding appliances, cabinetry, sink, countertops and flooring. The warmth of the kitchen and its centrality in the home should be bolstered by colours that bring out these qualities in the other elements of the kitchen. Traditional kitchens have a certain look and feel, and part of that is undeniably the colour scheme. The colours you opt for are the glue that brings the whole look together. If you are trying to get that traditional look just right but are worried about your colour scheme, keep the above colour tips in mind and get the traditional kitchen look you’ve always wanted.